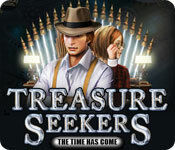 The time has come for Nelly and Tom to stop a potential catastrophe and save the world in Treasure Seekers: The Time has Come! With new powerful devices, such as the Ring of Time and the X-Glass, Nelly and Tom must go on their most exciting adventure yet! Is Totenkraft really as evil as they previously thought? Find out in this incredible Hidden Object Puzzle Adventure game! Use your Paranormal Crime Investigation skills to solve a string of bizarre murders plaguing the city of New Orleans! Help Sam rescue his love Anna in Brink of Consciousness: Dorian Gray Syndrome, an incredible Hidden Object Puzzle Adventure game!